The DiMarzio DP223 PAF bridge position humbucker pickup uses new technology to duplicate the qualities of vintage electric guitar pickups--without sacrificing the presence and open sound of the best vintage humbuckers. This 36th anniversary PAF bridge pickup, a hotter version of the PAF, isn't just for set-neck 24-3/4" scale guitars, but is also an excellent bridge pickup for tremolo-equipped bolt-on neck guitars. There was no such thing as a neck or bridge humbucker in the 1950s, but there was a wide range of performance between individual pickups that made some better suited to one position. Some of the old pickups had a lot of wire on the coils, which created more power and a warmer tone. Want to go totally retro? 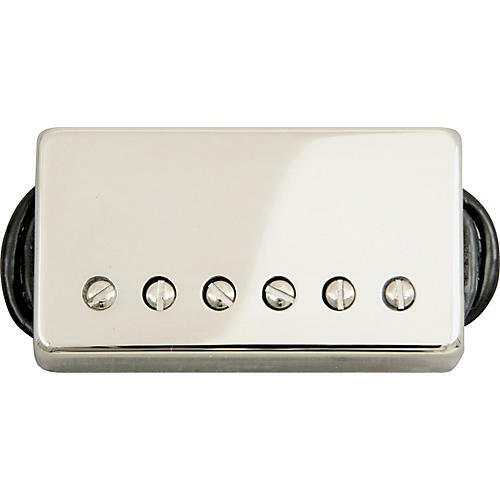 The DiMarzio DP223 PAF Bridge pickup in standard spacing is also available with authentic vintage bobbins in glossy black, glossy double cream or glossy black and cream zebra; vintage "Patent Applied For" long-legged nickel-silver base, 1-conductor cable and your choice of polished and plated or vintage worn cover. The 36th anniversary DiMarzio DP223 pickup is recommended for: Bridge position, can also be used in neck position with hotter bridge models. Tech Talk: The DiMarzio PAF bridge pickup has the best qualities of the Virtual PAF bridge and Virtual Hot PAF pickups and then some. It's as loud as the VHPAF but has as much low-end and midrange definition as the VPAF bridge model. The highs are actually bigger and smoother than either model. The 4-conductor version also splits very well. Single-coil mode is bright, but not at all sterile-sounding.